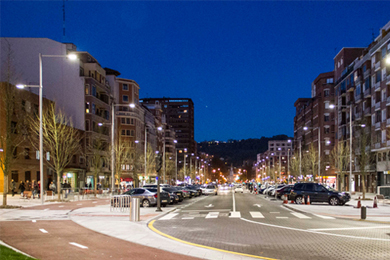 The project to demolish the interchange and carry out an overhaul of Sabino Arana Avenue is part of the Bilbao Urban Evolution, as it is called, which has led the city to be characterised as a shining example of an urban renewal to transform an industrial city into a cultural, service-based city. The process for the comprehensive upgrade of Basurto neighbourhood, involving a host of initiatives such as the placing underground of the narrow-gauge FEVE railway or the urban regeneration of the vicinity of Garellano, is taking a major leap forward with the demolition of Sabino Arana viaduct and the subsequent urban development of the area. It is a setting that spans some 40,000 sq. m. in which a range of spaces are planned: a major boulevard with wide pavements; a seating area with a children’s playground; a green area with trails; a large square housing outdoor sporting areas and offering spacious pedestrian zones. Santa & Cole have worked closely with the local technical services from the Urban Development and Sustainability Policy Coordination Division, and with Saitec Engineering, on planning for the lighting and urban furniture. Historically, urban areas have constituted a vital point of reference when it comes to examining the development of cities, since they are where societies are represented and indeed they are the forums through which communities depict themselves. In this context, public design takes on a leading role in shaping a city’s image. With this rationale in mind, Santa & Cole approached the project lending it their unique perspective in order to envision this remarkable space in a new light in the conviction that merely providing a function does not suffice; instead, they strongly believed that it was vital to take into account the emotional states an object or ensemble can convey to users in terms of cultural identity. Another essential requirement of modern urban development is taking on sustainability as one of the pillars of the project by following principles of biophilic design. Not only it is a matter of no longer polluting the planet or remaining neutral, it is about being positive and generative, improving our environment of biodiversity. Accordingly, the elements used in the project strive to serve a purpose and be long-lasting, well-designed and ergonomic, having been conceived for everyone, manufactured using recycled and recyclable materials and made by the local industry in an environmentally-friendly manner. Today, the evolution of new technologies makes it possible to come up with ever more efficient elements that boost energy savings and minimise pollution. All of this without impairing aesthetics and avoiding detriment to lighting and environmental qualities, maintaining the ability to fuse with the setting and its needs. The use of LED technology applied to lighting on this journey has made it possible to achieve far greater energy efficiency than that afforded by traditional technologies on account of the fact that it provides remarkable efficacy, offers defined light emission and is easy to manage. Furthermore, it is worth pointing out that it offers remarkable light quality; white light allows areas to recoup their colour during the night time. Thus, the city nightlife takes on a new dimension which, to some degree, is more exciting and appealing. Meticulous, careful planning of lighting has been done in order to strike a great blend of Candela LED and Rama LED street lamps, thereby lending each lamp an important role in shaping the final scene. 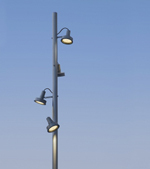 The Candela lamps, which are larger and more domineering, are intended for busy road traffic. 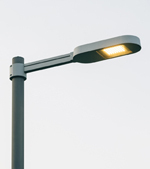 The Rama lamps, on the other hand, are used to light pavements and pedestrian areas in general seeking to strike a more human chord. The layout is completed with directable Arne floodlights affixed to tall poles, using the most suitable optics, thereby providing lighting for larger, more uneven areas in a precise, comfortable way.